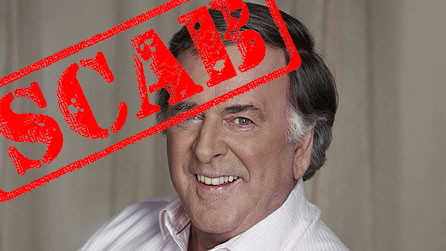 Terry Wogan, one of the BBC's highest paid presenters scabbed on the strike of BBC workers against cuts in 2005. The Guardian reported that he said he supported the strike but felt he was not in a position to join the 24-hour walkout. "Of course I have sympathy for them [the strikers] but I have a job to do. I am on a contract," he said. Of course all of the strikers also had contracts. Wogan also faced criticism for taking over £10,000 payment for helping present Children In Need in 2006, on top of his £800,000 a year fee for his breakfast radio show alone. Other presenters, like Natasha Kaplinsky - who refused to cross BBC picket lines - and Fearne Cotton waived their fees. Hall had actually already pled guilty to the indecent assaults of 13 children, some aged only nine years old. Even worse, he did a number on David Icke. Never forgotten never forgiven. Justice prevails though - Dave said that one day Wogan would die and true to form his vision has been proved correct. Scoff at his insight at your peril comrades.